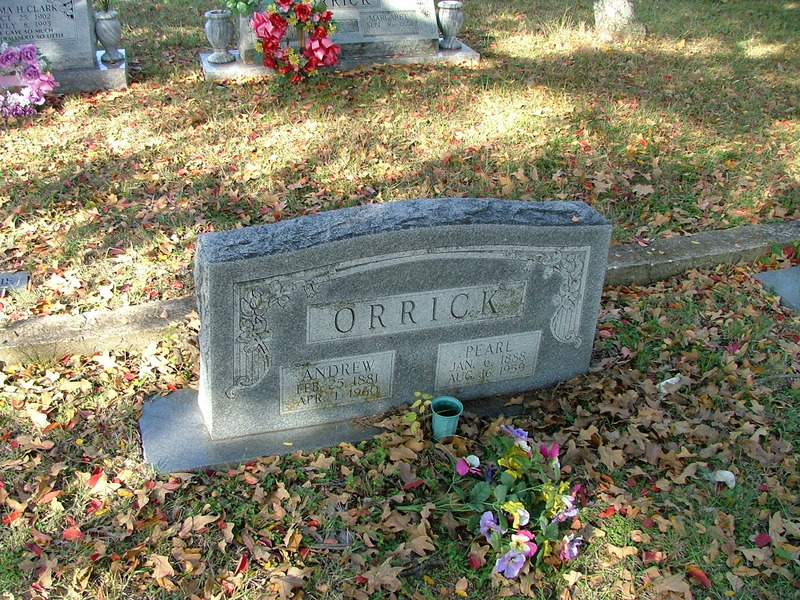 Several Orrick families in and around Dallas TX are descended from the middle TN Orricks - James Allen Orrick and Elizabeth Muncy's youngest son James Andrew and his wife Mary Pearl. Several in this family are buried in the Rylie Cemetery SE of Dallas. It's easy to get confused, this page is about James Andrew Orrick born 1881. He goes by Andrew. His father is James Allen Orrick born 1841. 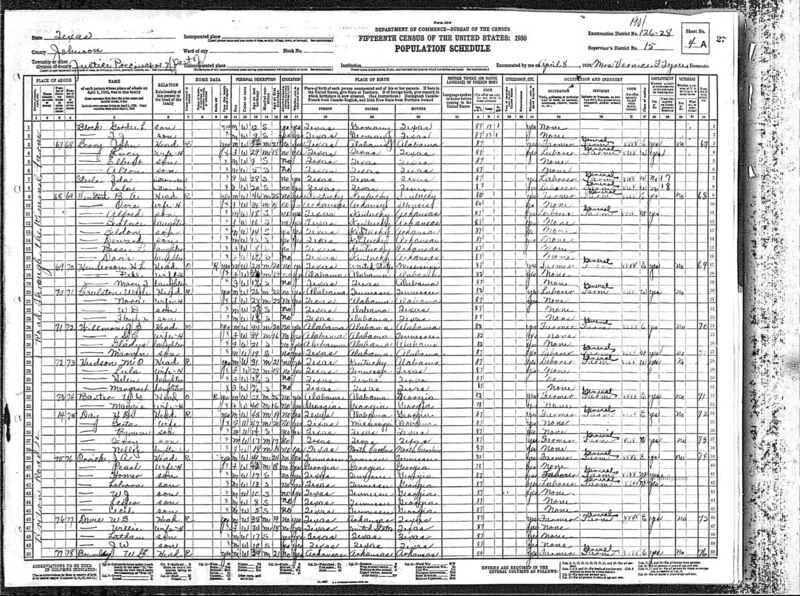 There is also a James Andrew Orrick, born 1893 in Pike Co AR. There is also an Andrew Orrick, born around 1882 in TN to Andrew Jackson Orrick and Precilla Summers. Rylie TX is a very small town Southeast of Dallas in Dallas county. Near the intersection of Loop 635, I20 and highway 175. The city was on land owned by John R Rylie who settled around 1850. Here is the WOW grave of his son or grandson. There is no known connection between John Riley Arrick (1863-190?) to John W Rylie (1863-1903), only 10 miles away in Kaufman county. It's just a joke by the genealogy gods to confuse us more than we already are. Here is the entire enumeration of the Rylie Cemetery. 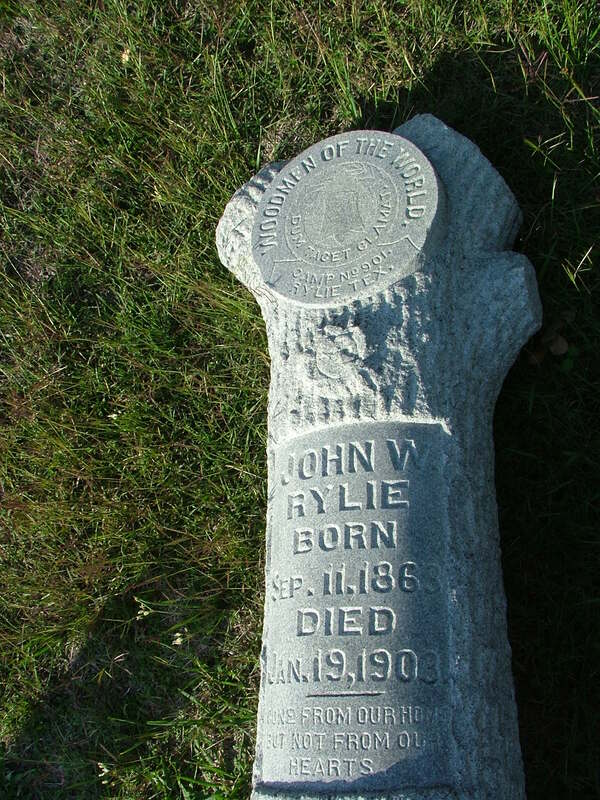 See these pictures of the Rylie cemetery, local churches and roads - Nov 2006. POUNDS Maybelle September 14, 1906 Shares marker with Merrman Pounds. James A. Orrick is the future father of James Andrew Orrick. They are living next to Bates, Derryberry, Lance, Prater, Youngblood, Davenport families. And other Orrick families. James A. Orrick is living with his mother Martha, 60, in Warren TN. They are living next to Nancy Orrick and kids, Jno Orrick and family, Whitlock families, Davenports, Northcutts, etc. 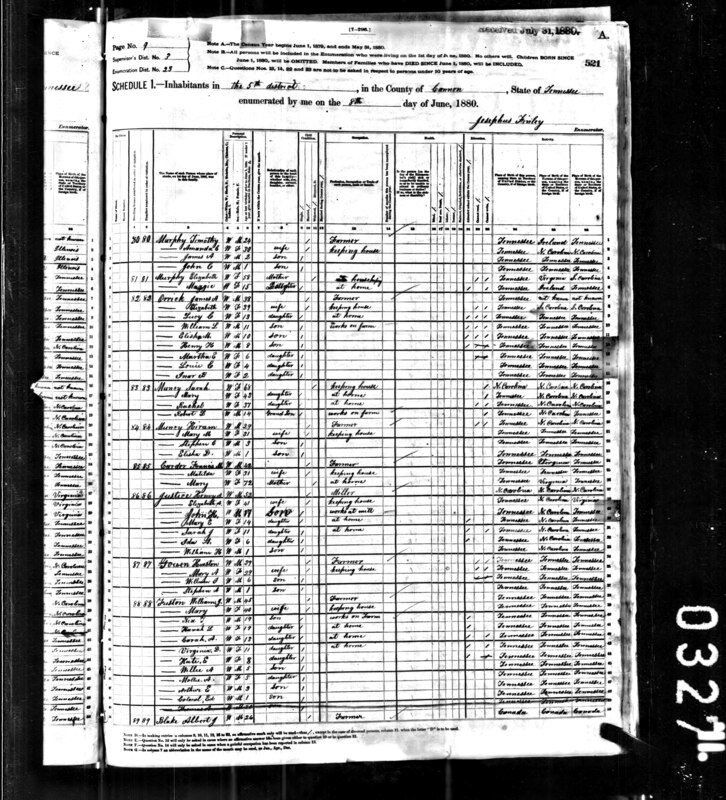 James A. and family are written as Orick in Cannon Co, TN census. After them are a family of Muncys. Here's the growing family in Cannon Co, TN census. Lucy, William, Elisha and Henry are gone. 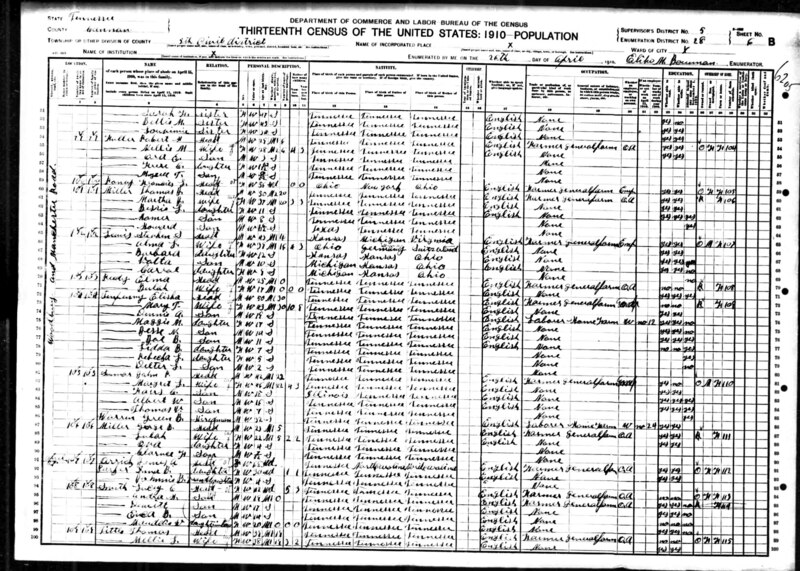 This is the first census showing James Andrew and his sister Fannie. 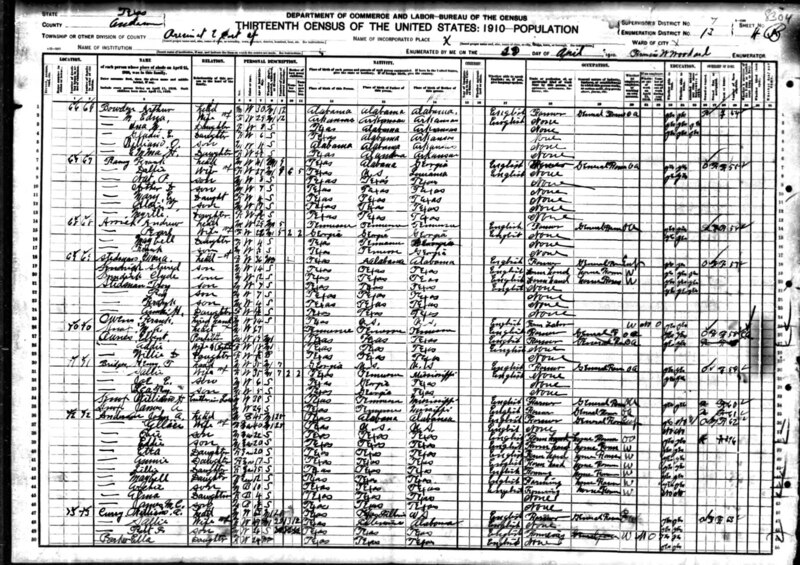 The 1900 census is great because it gives us the month of birth. 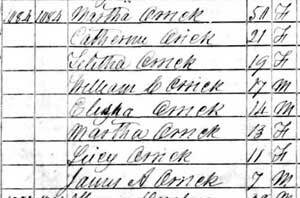 Here's the growing and shrinking family in Cannon Co, TN, enumerated as ORRIC census. 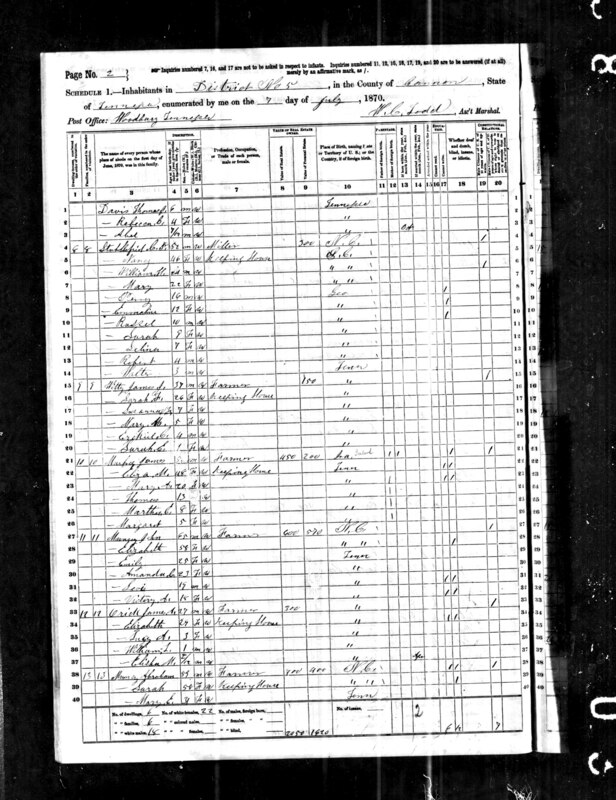 Elisabeth Orric, Oct 1840, Mother of 9, 8 still living, Father NC, Mother NC. After them on the same page are Muncys. 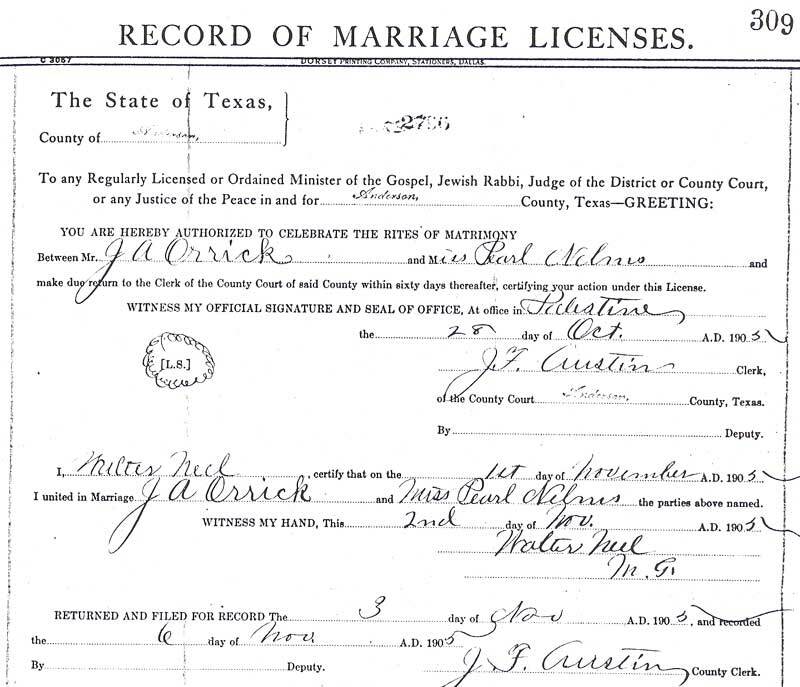 James Andrew Orrick and Mary Pearl Nelms married on 2 Nov 1905 in Palestine TX, Anderson County by Walter Neel, M.G. Here is James Allen living with his daughter Ina B with her new husband Johnnie B Parker in Cannon Co TN. census. Elizabeth is gone, all the kids flew the coup. Here in Anderson Co TX (North East TX) is James Andrew Orrick and his new family with Mary Pearl Nelms. Notice they are enumerated as Arrick. census. 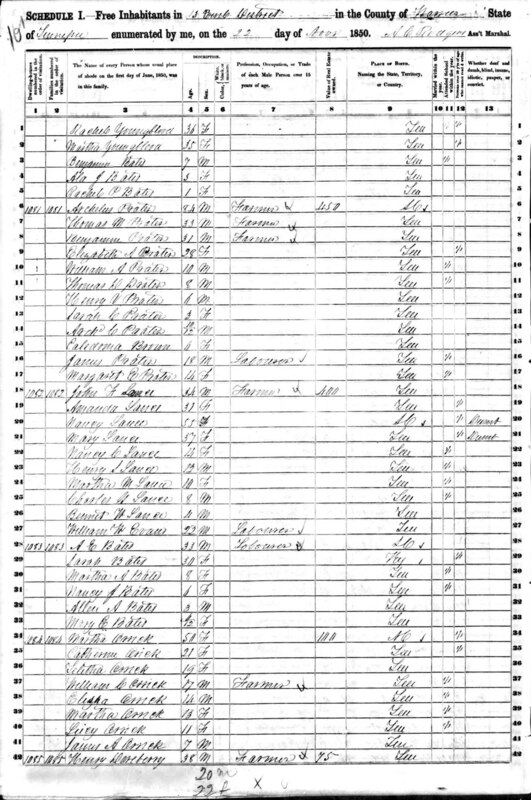 Andrew and Pearl have moved to Ellis Co in the 1920 census. 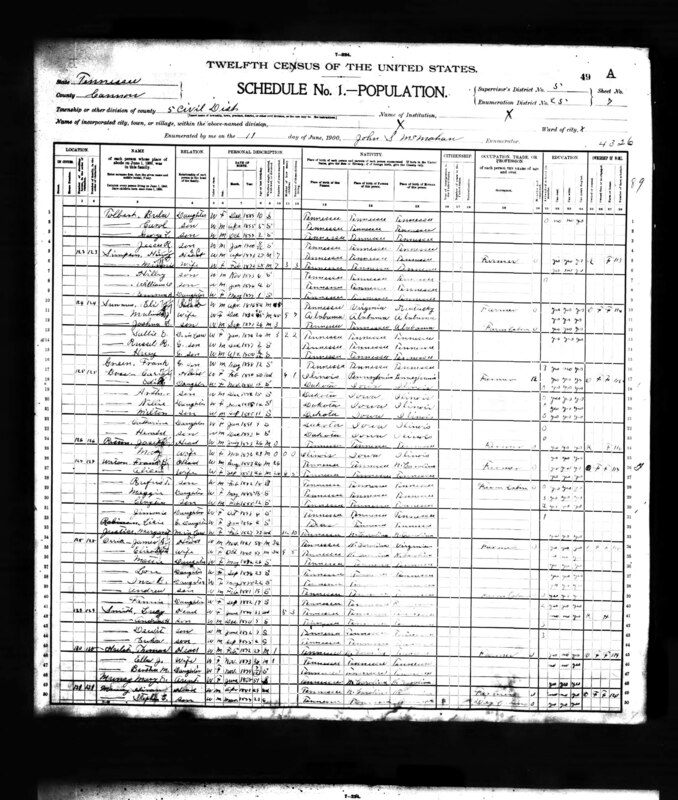 Andrew Orrick's family was very hard to find in 1930 because they are transcribed as Dorich by Ancestry.com. I've submitted a change request. In Dallas, Maybelle is now married to Merrman Pounds and living with them is Frank Orrick. Frank Orrick, 21, weaver at box factory? 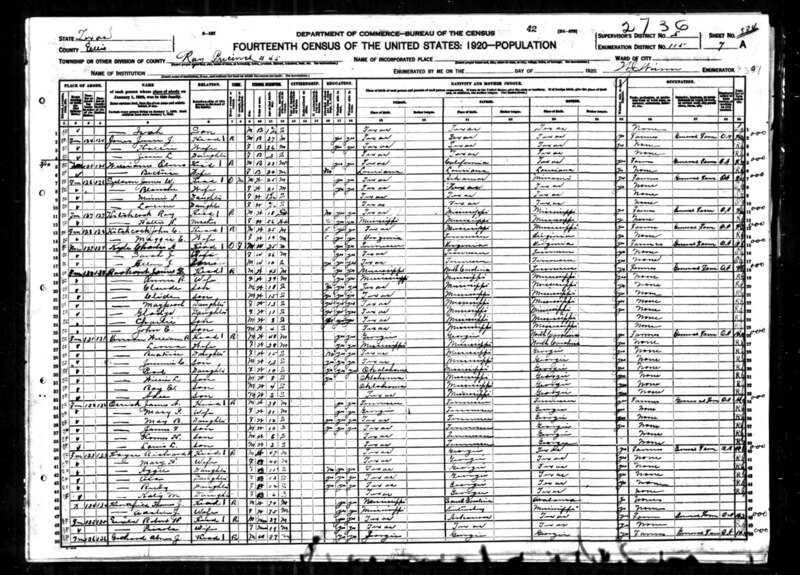 The 1940 census will be released in 2012.